In this short section you will be advised to read some material directly on he website for the central bank of Canada, namely the "Bank of Canada". You are strongly encouraged to do this since it is the best way of learning about the activities of this institution - directly from the source. This section is titled "Backgrounders"
"If the Bank wants to moderate a decline in the price of the Canadian dollar, it will buy dollars in foreign exchange markets in exchange for other currencies, mainly U.S. dollars. This boosts demand for Canadian dollars and helps support the dollar's value. ... if the Bank feels the dollar's value is rising too quickly, it can sell Canadian dollars. By selling dollars, the Bank increases the supply of Canadian dollars in foreign exchange markets and this tends to moderate the rise in the value of the dollar." 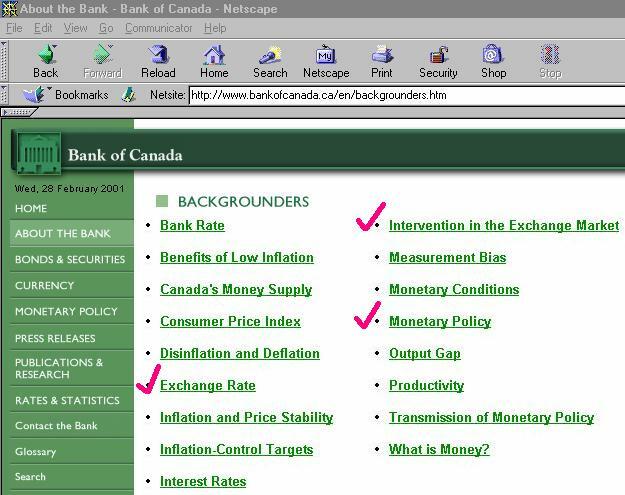 2005 Nov 2) "The actions of the bank are a consequence of the political environment - meaning what the Finance Minister and the Prime Minister think is in the best interests of the Canadian economy. The economic environment has a big influence in their decision - but ultimately, they have to make a choice. - which means a high dollar is better. The reason I (WTGR) said it is "political" is because different parts of Canada have a different economic environment which depends differently on exports vs imports. In some parts of Canada, the economy is heavily dependent on exporting resources and resource based products. In central Canada (meaning Ontario) we import a variety of things and therefore a high dollar is better, especially if those imports are used to make something to export, it can help make our export price more competitive. The government makes decisions based on the opinion of the ruling political party, and the main purpose of the ruling party is to get re-elected. So you can see that a government policy about currency appreciation, or decline, is both politically based and economically influenced according to domestic considerations and international opportunities.